Gunbot has +37 strategies and more than 100 indicators that can be used for trading. The different strategies can be combined to define when the bot needs to buy or sell. This means that it is possible to use the BollingerBands strategy to buy and the gain strategy to sell for example. The emotionless strategy is perfect for beginners. It does not require any type of knowledge about trading or the Gunbot itself. No need to configure different settings, only the trading limit is necessary, the bot does everything else! Emotionless gives the opportunity to traders to make modest profits with a relatively safe strategy. An algorithm based on the Ichimoku cloud indicator helps the bot to choose when to buy and sell. This strategy does not require a lot of configuring and works with an algorithm based on the Ichimoku cloud indicator. Gunbot looks for optimum entry and exit points to buy and to sell, which can take a certain amount of time. Entry and exit points consider tenkan sen, kijun sen and kumo sentiments. The Ichimoku strategy is meant for long term trading; don't be surprised if there are long timeframes between buying and selling! 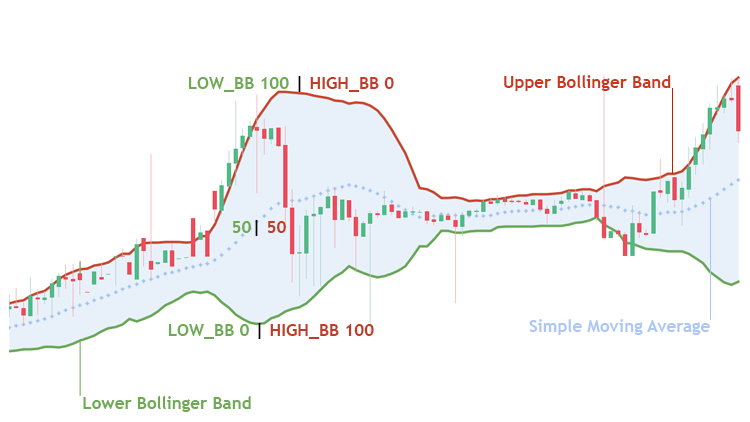 The Bollinger Bands are indicators that indicate relatively low and high prices. The strategy allows you to set the distances from the low and high Bollinger Bands where you want the bot to buy or sell. The strategy can be combined with other indicators such as RSI, MFI or stochastic and can become one of the most powerful strategies Gunbot has to offer. This strategy is often combined with step gain, where the bot buys based on the Bollinger Bands and sells with the step gain strategy. Gain is a simple and effective strategy which allows you to sell when the price is a defined percent higher than the price it bought. It is often combined with another strategy that is used to buy but this can also be managed by the gain strategy. When using Gain as a buying strategy, it will buy at a fixed percentage below the lowest EMA at that moment. In contrast to the Gain strategy, which sells at a fix percentage above the bought price, Step gain gives the opportunity to ride a wave when the price goes up and sell when the trend reverses. A range of desired minimum and maximum profit has to be set in the Gunbot so that it can sell in this range. Buying with the Step gain strategy is also possible and also works with a range. You define a range below the EMA where the bot may buy; as soon as the trend changes from going down to going up, Gunbot buys. The TSSL strategy allows you to make bigger profits. The Gunbot will not sell as long as the price goes up, once it drops, Gunbot will immediately sell. It works based on trailing stop limits that have to be hit before the bot can place a sell order. Buying with this strategy is also possible; Gunbot will start trailing under the EMA for the best buy price. 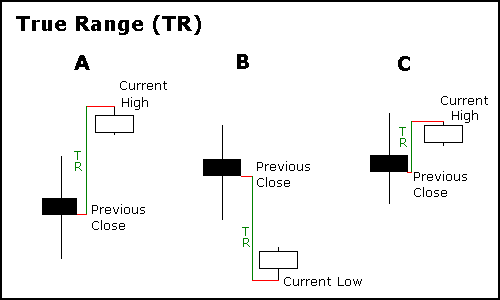 The trailing is similar to the trailing for selling. Ping pong allows you to set a specific buy and sell price. It gives the opportunity to automate the trading and is effective with pairs that hit the same resistance and support prices repeatedly. This strategy is based on the ADX indicator. Gunbot will be able to buy when prices are going up and ADX indicates a strong uptrend. This strategy, like any other strategy in V10 is can be used with other indicators like for example an RSI. 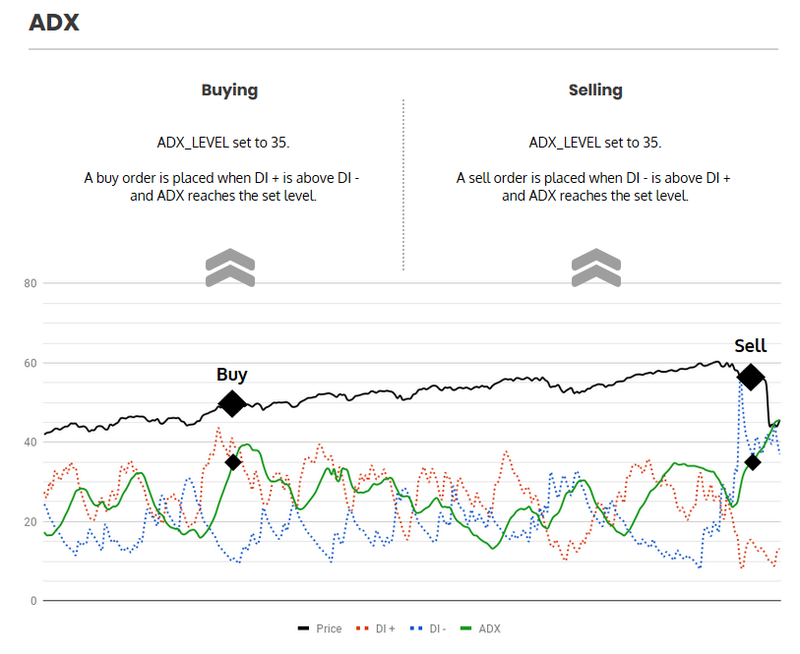 More information about the ADX indicator. The crypto market is very volatile, the Average True Range (ATX) is an indicator that measures it. The Average True Range Trailing Stop uses ATX to calculate trailing stops to provide buy and sell signals when volatility increases or decreases and crosses the trailing stop. More information about the ATX indicator. This strategy is based on the EMA indicator. Gunbot receives information of the prices going up as a result of the spread between the fast and the slow EMA decreasing. The spread decreasing again is an indication of the price going down again, which triggers a sell order. 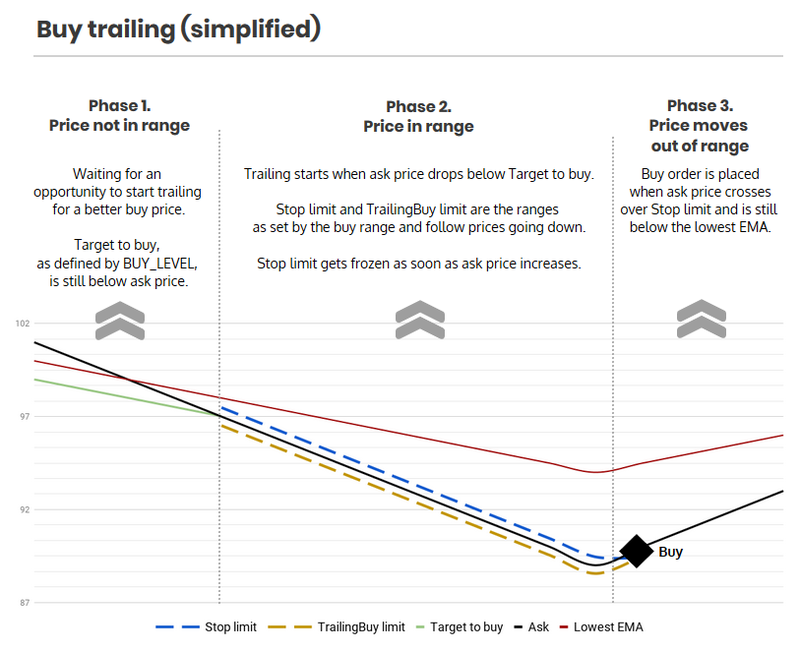 The EMA spread is calculated each cycle by subtracting the lowest EMA value from the highest EMA. Like every other strategy, this can be combined with other indicators. More information about the EMA indicator. This strategy tries to predict the close price of the next period. Xtrend and Smacross indicate the strength of an expected price move. 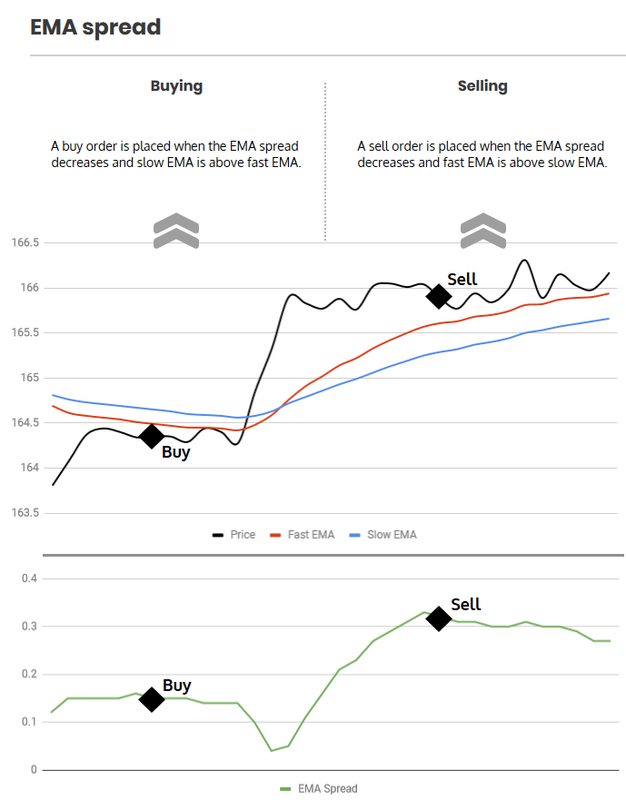 This enables Gunbot to place a buy order when the buy price crosses under the forecasted price and a sell order when the bid price crosses over the forecasted price. This strategy is placed on the MACD indicator, which indicates when momentum is likely changing. Gunbot buys when the MACD indicator crosses over the signal line and sells when it crosses under it. More information about MACD indicator. 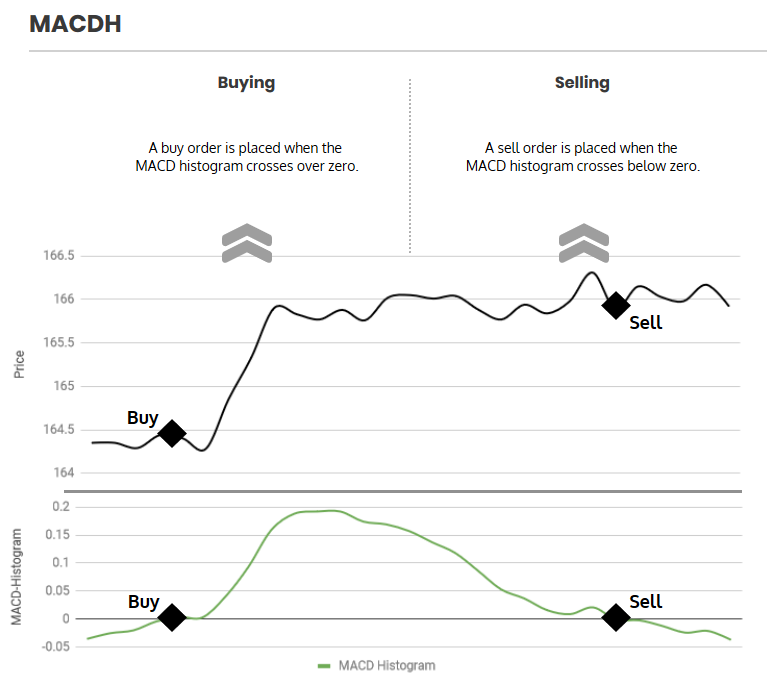 Another strategy based on the MACD indicator is the MACDH, which is based on the MACD histogram, which can indicate when a MACD crossover is likely. 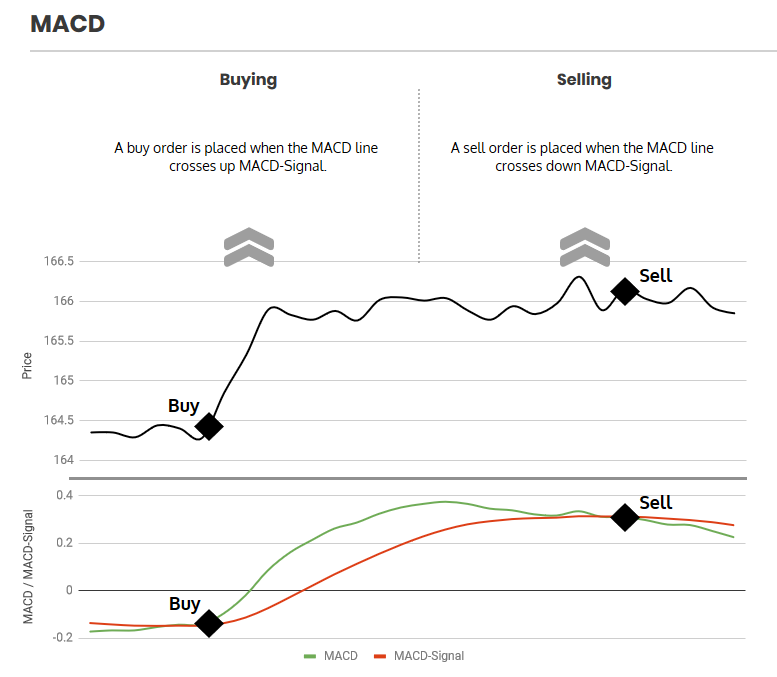 A buy order is placed when the MACD histogram crosses up the zero line. A sell order will be placed when the MACD histogram drops below 0. The Average True Range (ATR) is an indicator that measures volatility. This strategy uses ATR to calculate trailing stops to provide buy and sell signals when volatility increases or decreases and crosses the trailing stop. Using the configurable ATRX multiplier for ATR, a lower and upper limit are calculated. The lower limit, called ATR short, is calculated by substracting the result of ATRX from next rounds bid. The upper limit, called ATR long, is calculated by adding the result of ATRX to next rounds ask. A buy order is placed when the ask price crosses up ATR long. A sell order is placed when the bid price crosses under ATR short and price is above the break-even point. As ATR does not provide information about price direction, it is strongly recommended to use an additional momentum indicator like RSI. More information about the ATR indicator. 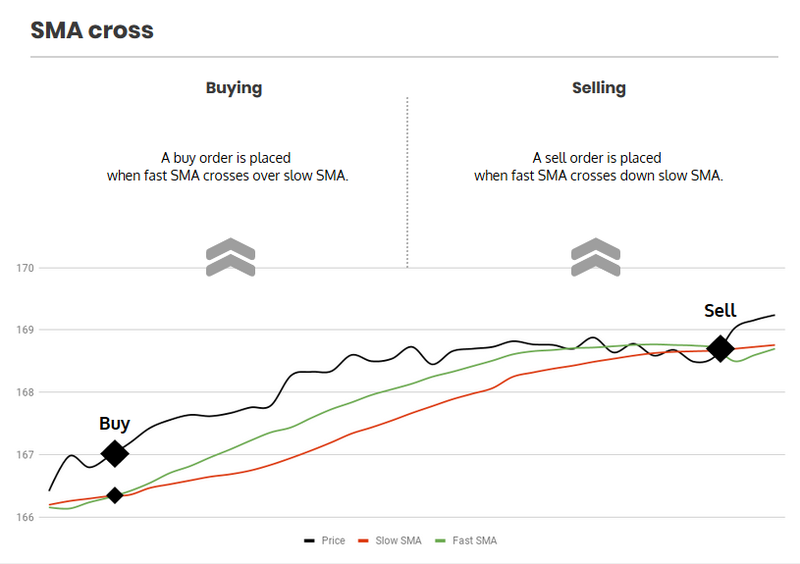 This strategy is based on the SMA indicator, which indicates to the Gunbot when the price is moving up, when the fast SMA crosses over the slow SMA. 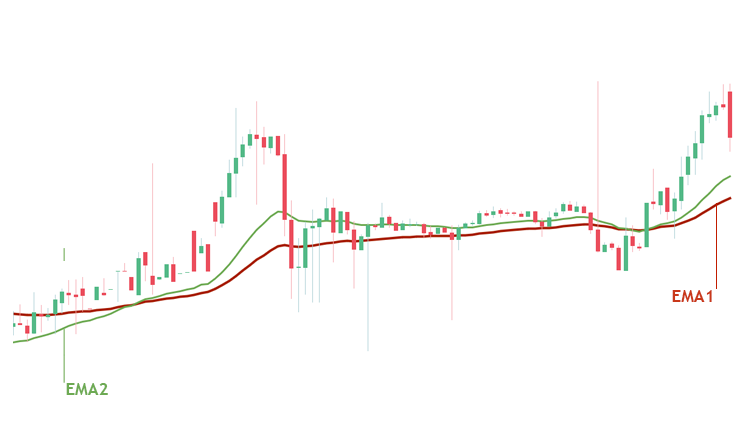 Gunbot will sell when it's the other way around, when the slow SMA crosses under the fast SMA. More information about SMA indicator.